The starting point for our work is to talk to people affected by dementia. We're curious about travelling with dementia and what might make life easier. Lots of stories and insights emerge and we use these to help us to shape the training we're developing for transport operators. 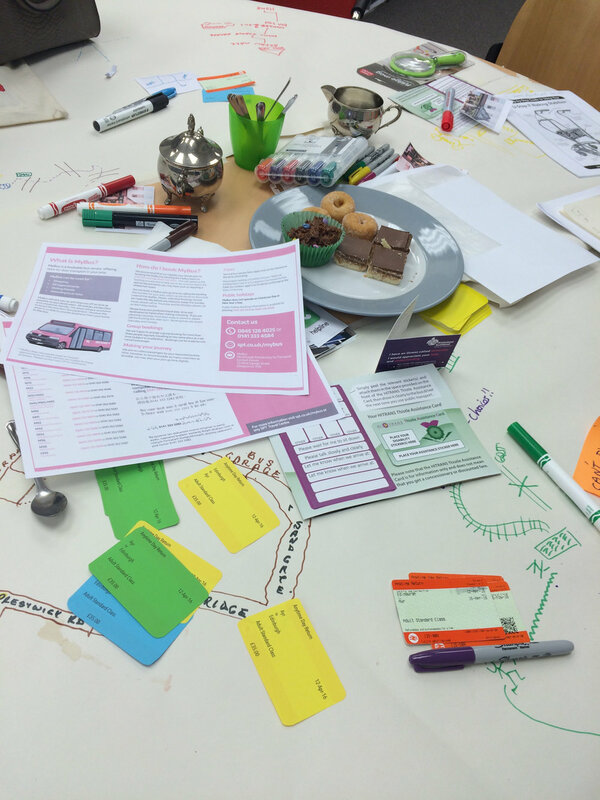 If we can help service providers to understand the challenges of travelling with dementia and share some of the ideas that people have, then we can start to move towards better services. We've had some great conversations with people with and without a diagnosis of dementia. Everyone has travelled in some way, everyone has a story. People often raise challenges that we can all face. We've developed some simple tools to help shape conversations about mobility and you're invited to use them too. Feel free to download and print the resources below and use the accompanying notes to guide you through the process. In our experience no two workshops are the same, so just work in the moment and see what emerges. You can have a quick 10 minute conversation or, if you want to explore things in more depth, an hour or more would be good. In our experience the following format can help to have good conversations about getting out and about. In addition to tea, coffee and probably cake, we usually need little more than the printed pages below, some pens and the odd post-it note. We've created some nice postcards with transport-related pictures which can help to illustrate points - get in touch if you'd like to know more about these. The key thing is to get conversation flowing, to listen and be ready to capture experiences and ideas. You could also show a short video such as this one about taking the bus or listen to this short clip about Wendy's experiences on trains. Start by asking people to draw their journey from home to wherever you're sitting right now. This warms us up and flexes our discussion muscles. You can print this page to help with this introduction. The title is important. There's a lot that is good about travelling and about transport services. Things could always be better but let's recognise and share what works! This is an activity that uses picture prompts to allows us all to do this, as well as discuss what could be better and also to ask questions. You can print these pages to start discussions about different topics. Quotes from other people can also help to sum up situations - you could ask if they resonate with the group. Here's a page with some quotes that you can print along with the relevant picture - you can cut them out and fold them. One of our observations is that there is support out there to travel but not everybody is aware of it - including us! We often learn about local discounts, schemes, transport options and assistance by talking with people living with dementia. Local knowledge is powerful and sharing that among the group can be useful. We sometimes prompt this by showing examples of assistance cards (such as the Thistle Card) or asking about experiences of using services such as Passenger Assist. If, after the first few activities, there is interest in doing more or in tackling some of the issues raised, you could discuss as a group what to do next, together. It might be to talk with a local transport operator or organise a visit. One group has started a petition, others have made films. You might just want to send a message to a transport operator or invite them to your next meeting. It's really helpful to know how the resources are being used, what you've discussed and learned, stories that are emerging. If you're happy for us to do so, we would like to share them with transport operators to help to illustrate the challenges of travelling with dementia. We will also share them with people affected by dementia - it's good to know that we're not alone in our travel challenges. Where was the workshop/conversation held? Who organised it? Who was there? What will happen next? did you make any plans to do this again or to take forward any of the issues raised? Anything else? Any questions? Any suggestions? Are you OK with us sharing your stories and examples?